Tognum Group Brand MTU has announced that it will update its Series 1163 marine engines for IMO 2 and IMO 3 emissions regulations. While more and more vessel manufacturing is shifted to shipyards in Asia, this will not only contribute to a more environmentally friendly Asian coastline, but also empower Asia to supply more vessels with both powerful and clean marine engines to the world. The upgrade further demonstrates MTU’s commitment to providing customers with the perfect engine choice for upcoming project designs. The news was announced today to distributors, OEMs and end users at the IMDEX, held in Singapore, May 18-20, 2011. 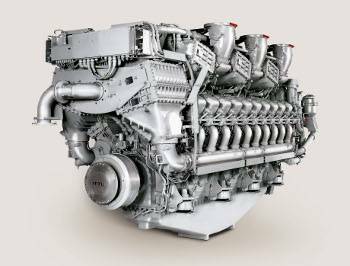 Series 1163 engines have been proven in the maritime industry for decades. The upgraded environmentally-friendly versions feature several improvements from the previous models. New features include the common rail injection system with1,800 bar injection pressure, the MTU ADEC electronic engine management system which has already proven itself on Series 2000 and 4000 engines, and a new combustion process. Compliance with the IMO 2 emissions regulations will even be achieved using only in-engine technology and without exhaust aftertreatment. IMO 3 emissions regulations, which will be introduced in 2016, will most probably be met by using an SCR system to reduce nitrogen oxide emissions. This ensures that in future, the engines will be able to continue to operate in Emission Control Areas (ECAs). In addition, the new engines’ high performance can be contributed to the excellent power to weight ratio, high reliability, and a superior shelf life. This makes it perfect for both civilian and defense applications ranging from offshore turbines, frigates, corvettes to fast ferries. “We have seen strong demands for naval and governmental vessels in Asia and the need for vessels to be compliant with the current and future emission standards are on the rise. Customers are now seeking propulsion solutions that are both environmentally friendly and technologically advanced. With the upgrade of the already proven Series 1163 engines, MTU is able to address these sustainability needs while enabling customers to enjoy even higher level of engine performance”, said Mr. Alex Choe, Director of Sales and Applications Engineering for MTU Engines, MTU Asia Pte. Ltd.
All of the major well-proven Series1163 engine features which are crucial for customers, such as the best power-to-weight ratio and acceleration characteristics in its class, its compact physical dimensions and the engine interfaces with the vessel, will remain unchanged. That means that additional options such as resilient mounts or an acoustic enclosure can continue to be used in the future. The 2-stage turbo-charging technology will also be retained, but with its efficiency optimized even further. The new engines will also meet the latest requirements of the classification societies covering, for example, low noise emissions, high shock resistance and shielding against electromagnetic influences. The three cylinder configurations (12V, 16V and 20V) in the 1163 engine family cover a performance range from 4,440 to 7,400kW at 1,300 rpm. With a 230mm bore and 280mm stroke, the series gets its name from its per cylinder capacity of 11.63 liters. As a pioneer in the marine engine industry, MTU has been supplying high performance engines to Asia and global customers for over 100 years. In Asia, MTU has become a preferred supplier of most of the coast guards and navies.